There’s a bit of a buzz about this middle eastern street food right now. Think back to when you didn’t see pulled pork everywhere, that’s what it’s like right now. 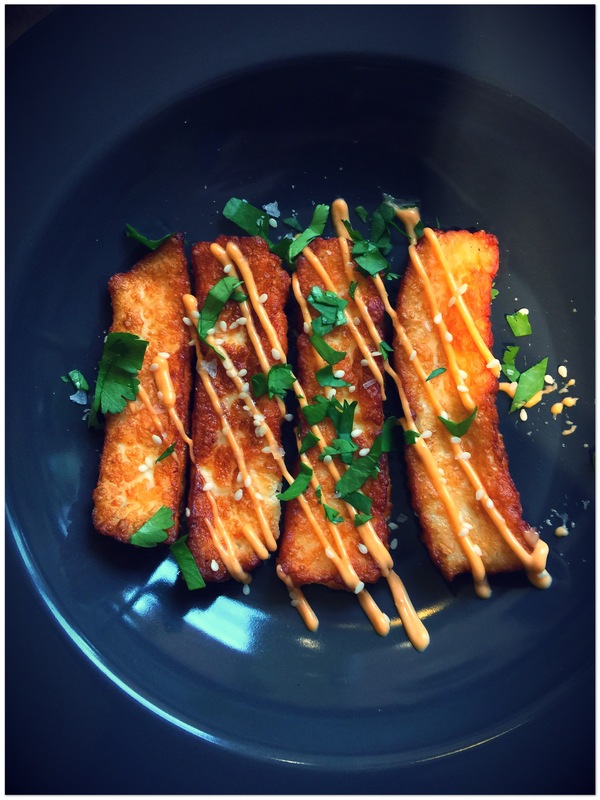 Deep fried halloumi is going to turn up where you’re least to expect it. Halloumi cheese is often grilled and served with harrisa paste. As this sheep’s cheese has a high melting point it works well with heat. So deep frying it makes perfect sense. Halloumi is high in fat and protein and low in carbs, perfect for your low carb diet. Mozzarella sticks will seem so bland after you try these little beauts. Heat enough oil in a large pot for deep frying. Chop halloumi in to chip size pieces. Fry until golden. This won’t take long at all. So do it in small batches. Season fried halloumi with salt and sesame seeds. For the sauce mix 3 tablespoons of mayonnaise, 2 tablespoons of shiracha, 1 teaspoon of sesame oil and a squeeze of lime juice. Mix well and serve with the deep fried halloumi and garnish with chopped coriander.